There is one place, not far from here, where among the halls of a local school, math is actually becoming a fun and exciting subject. At first, this may seem hard to believe. Though so too, perhaps, is the notion that almost anyone, regardless of initial ability or inclination, can get pretty good at learning and even teaching math. But it’s true. At Talawanda Middle School a buzz is building. Here, an afterschool program that involves sixth grade school students and their Miami University college tutors is quickly boosting the abilities of all who participate. 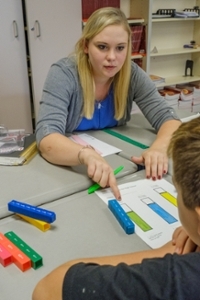 Officially called “FUNdamentals Math Club,” the program is the result of ongoing partnership between Talawanda and Miami University’s College of Education, Health and Society (EHS), where Sarah Watt, assistant professor of educational psychology, serves as one of the primary architects. “I have been working on preparing EHS special education candidates to be knowledgeable in math content as well as the pedagogy,” Watt says. “So we started this partnership. The purpose is to collaborate with the Talawanda math teachers, their special education teacher, and our Miami teacher education candidates to provide after school tutoring. And we don’t target just students with disabilities. 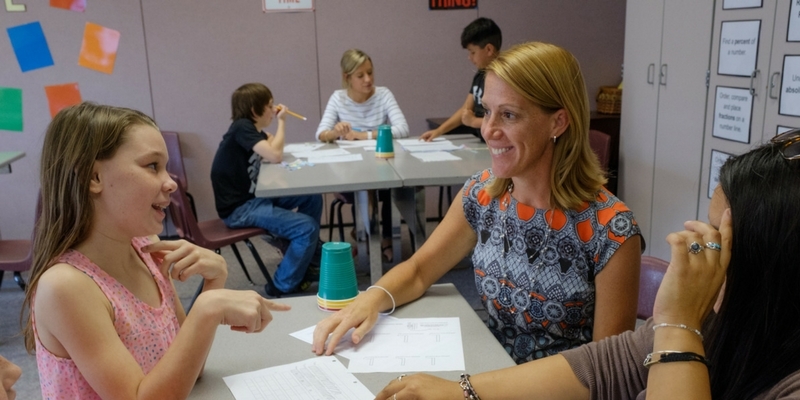 Watt, along with her Talawanda colleagues, sixth grade math teachers Waite and Don Gloeckner and special education teacher Kristi Herald, are all behind the math club’s design and evolution. And the program’s structure is simple. Every Tuesday afternoon, Miami’s special education tutors first meet with the Talawanda teachers to go over the same math content that the middle school students have been covering. This gives the college tutors the chance to ask questions and review any unfamiliar material. Then on Thursday afternoon, armed with this relevant content knowledge, the college tutors come back to Talawanda much more prepared and ready to work directly with the middle school students, who are now also in a much better position to succeed. This process not only helps struggling middle school students receive the focused one-on-one support they need, but it also helps the Miami special education majors prepare for a rapidly changing educational environment, one they must soon navigate as professional teachers themselves. In the past, special education teachers would pull students out of general education classes and teach them remedial content. However, new legislation has changed graduation requirements and now all young students must pass the same algebra II and, in some states, trigonometry standards. And this can be a tremendous challenge for both students with learning disabilities and current special education teachers, who must now somehow tailor increasingly advanced mathematical content to different kinds of learners. So, really, what Miami’s EHS and Talawanda have built together is more than just a math club. It is actually a professional learning community. It brings together experienced professional teachers, struggling middle schoolers, and college-aged special education tutors, many of whom themselves also expressed trepidation and uncertainly around teaching the very same mathematical concepts these middle schoolers are struggling to learn. And so far, it’s working exceptionally well for everyone involved. 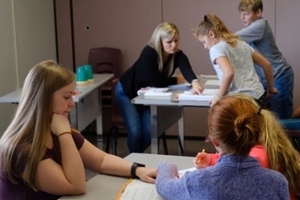 Watt’s research around the program shows significant increases in the self-efficacy of the special education majors who now feel much more confident, comfortable, and prepared to teach mathematics. They also reported a greater understanding of the “why” around teaching various concepts, as opposed only previously understanding the “how” to solve certain problems. And as for the Talawanda middle schoolers? Watt also found significant increases in their motivation and performance as well, which are improvements their teachers are seeing back in the classroom. For many people, math is, perhaps, among the most feared of the general subjects. But often the real hurdle is the intimidation it can stir within, and then the discouragement and frustration that can easily escalate afterwards. 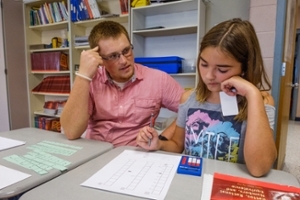 But by working closely with their college counterparts, these Talawanda middle schoolers are starting to realize that with practice and concentration they, too, can improve their mathematical abilities. And their willingness and eagerness to forge ahead is growing as a result. So today, scores are up, confidence is high, and all of a sudden math doesn’t seem so scary anymore.